Iron—Most of the nutrients from your daily diet will help meet your iron requirements. 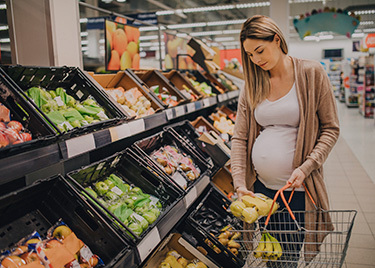 Pregnant women are more prone to get sick from listeria, harmful bacteria found in many foods. Listeria can lead to a disease called listeriosis, which can cause miscarriage, premature delivery, serious sickness, or the death of a newborn baby. 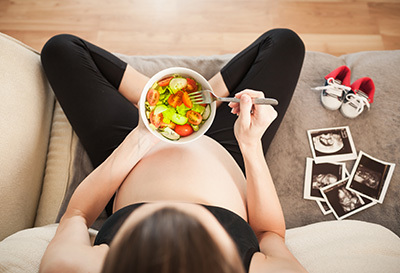 If you’re pregnant, you need to make sure your foods are safe to eat. To avoid listeria growth in your refrigerator and freezer, set the temperature to 40 degrees Fahrenheit or lower and 0 degrees Fahrenheit or lower respectively. Check your refrigerator’s temperature using a refrigerator thermometer. Clean up all refrigerator spills right away—especially juices from hot dog packages, seafood, raw meat, chicken, or turkey. Clean your refrigerator’s inside walls and shelves with hot water and liquid soap, then rinse thoroughly. Use precooked or ready-to-eat food as soon as you can. Don’t store it in the refrigerator too long. Wash your hands after you touch hot dogs, raw meat, chicken, turkey, seafood, or meat juice. How will I know if I have listeria? Unfortunately, the illness takes weeks to develop, so you may not know immediately. Early signs include fever, chills, muscle aches, diarrhea, and an upset stomach. At first, it may feel like the flu. Later on, you may have a stiff neck, headache, convulsions, or loss of balance. If you have any of the above symptoms, call your doctor, nurse, or health clinic. Listeriosis can be treated effectively. For more information about food safety, visit the U.S. Department of Agriculture Food Safety and Inspection Service web site at www.fsis.usda.gov. If you have no contraindications, we recommend you continue to stay active. Walking and swimming are excellent exercises while pregnant. Avoid high-impact or jarring-type activities. Talk to your provider about what activities are best for you. During pregnancy, after childbirth, and as women get older the muscles of the pelvic floor that support the urinary bladder, uterus, and bowel relax. This relaxation can contribute to urinary incontinence. Fortunately, Kegel exercises can help strengthen these muscles, prevent future problems, and improve sexual pleasure. The pubococcygeus, the muscle that controls the pelvic floor, is activated when urination is interrupted. As you urinate, decrease or stop the flow, and hold it for a short time without tightening your abdominal muscles. After your bladder is empty, contract the muscle for five to 10 seconds, and then relax it for five to 10 seconds. You should practice this exercise regularly. Try doing Kegels five times every time you urinate. If you are incontinent when laughing, sneezing, or exercising, make sure to contract and hold your pelvic floor muscles. When you have the urge to urinate, do not run to the bathroom; this only increases the pressure. Instead, take deep breaths while contracting the pelvic floor muscles, and walk at a normal pace to the bathroom. If you regularly urinate in small amounts, you may be able to prevent leakage. Begin by urinating every one to two hours, whether you feel like it or not. Then, increase the interval between voiding by 15 minutes every week until the desired interval is reached. These exercises should become a habit and need to be practiced regularly for the rest of your life. For more information, visit here: FAQs – Exercise During Pregnancy.